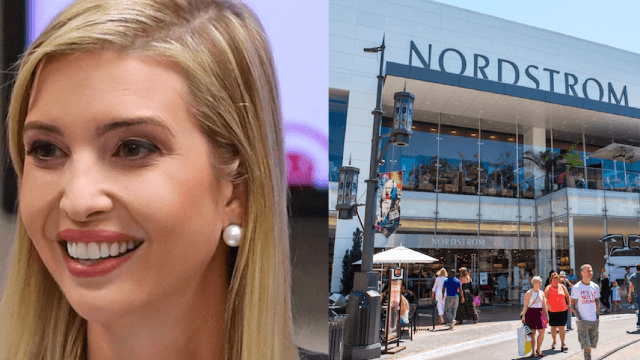 Nordstrom drops Ivanka Trump's clothing line because it's selling so poorly. A spokesperson for Nordstrom confirmed Thursday that the luxury department store will no longer carry Ivanka Trump's clothing line. This comes after the anti-Trump group Grab Your Wallet organized a boycott of the store several weeks ago, according to the Washington Post. Wow, nice job, activists, it worked! Each year we cut about 10% [of brands] and refresh our assortment with about the same amount. In this case, based on the brand’s performance we’ve decided not to buy it for this season. The cause and effect here is very clear. Over 230,000 Tweets and who knows how many millions of dollars’ worth of missed purchases later, they finally heard us. Nordstrom does still have four styles of Ivanka Trump shoes on their website, but they are heavily discounted. A representative for Nordstrom told the Washington Post that once they sell through that existing stock, there will be no more Ivanka Trump merchandise for sale at the store.